Portland, OR - Hand top chefs bottles of Oregon craft saké and ask them to prepare a multi-course meal paired with each. The catch? They must avoid the stereotypical Japanese/Asian fare and challenge themselves to step outside the usual and expected. It’s called Momokawa Supper Club and a series of dinners in 2011 created mind-altering experiences in New York, Los Angeles, Sonoma and Chicago. Now it’s time to bring it home, to Portland chefs. 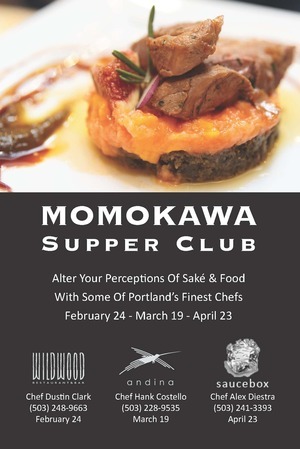 Join Momokawa (brewed and bottled by SakéOne, Forest Grove, OR) and partner restaurants Wildwood, Andina and Saucebox for this uninhibited culinary adventure. Experience what Chefs Clark, Costello and Diestra create without restriction as they apply their talents in Northwest regional, Peruvian and fusion cuisines. Guests will get a saké education throughout each dinner as they learn about saké and what inspired the chefs to create their menus. Reservations can be made with each restaurant independently. Seating is limited. Cost: $55 per person/per restaurant + gratuity. SakéOne is America’s premium saké company and importer of some of Japan’s finest saké. Founded in 1992 as an importer, SakéOne has been crafting strictly junmai ginjo quality saké at its state-of-the-art kura (brewery) in Forest Grove, the heart of the Willamette Valley: Oregon’s craft beer-brewing and winemaking mecca, since 1998. In 2010, SakéOne’s Momokawa “Ruby” Junmai Ginjo earned a silver medal at the prestigious U.S. National Saké Appraisal 2010, no small feat for an American producer in a crowd of more than 300 Japanese entrants and a judging panel held to precise Japanese standards. Though SakéOne clearly honors tradition, their Oregonian pioneering spirit is constantly evolving and has truly come to define Oregon craft saké. For more information, please visit www.sakeone.com. For media inquiries, please contact Kristin Namimoto at press@charlescomm.com or 415|701-9463.